As a businessperson using Social CRM, you need to figure out how to use the different modes of behavior and the attendant states of mind to reach your customers as they go through their day. For example, if you’re a health care provider, you may want to help your customers schedule appointments using their mobile devices. You’ll also want to know if your customer demographic uses a mobile device as often as predicted. According to a Nielsen Wire article posted on September 26, 2011, 62 percent of 25–34-year-olds own a smartphone. If that’s your demographic, you need to pay attention to mobile. Connecting: It’s no surprise that connecting is the main way people use their mobile phones. They text, send e-mail, check into their social networks, and instant-message their friends. Your main goal should be to make sure your message is appropriate for the platform. For example, if you want to engage customers while they’re on a social platform, you would send out a different type of customer message than one you send to a business e-mail address. The underlying message would be the same. Searching: Searching can be even more important to a mobile user than it is to someone sitting at his desktop. Search results could determine which location he heads to next. In 2011, Google published results of a study, The Mobile Movement, that includes this information: 77 percent of users go to a search engine first when picking up their mobile device. Viewing: When you’re creating content for mobile users, you have two choices. You can either develop an app that works specifically with your content or you can make sure your site is maximized for mobile viewing and provide a link to your original site. 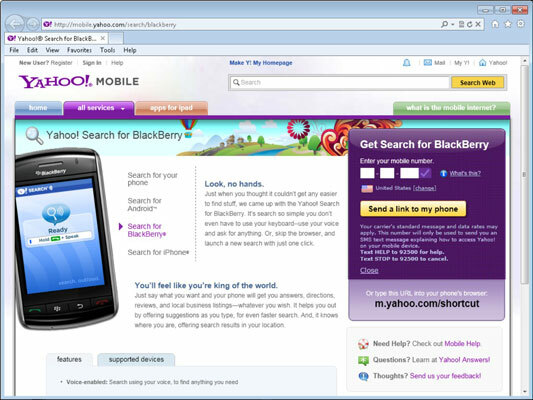 Check out how your site looks in the major search engines, including Yahoo!. A key takeaway for your campaign: Optimize your site for mobile viewing if at all possible. Entertaining: Mobile users love to entertain themselves on the go. Standing on a long line at the grocery store doesn’t inspire the boredom that it used to. Major TV and movie content producers have the bulk of your customers’ attention, users can text or play a game. Your business should consider the use of mobile games and contests to help your customers engage with your brand, like Elle Magazine. A key takeaway for your campaign: A game or contest with the right message can draw your customer’s attention when they want to engage with your brand. Managing: When users are managing tasks on their mobile devices, they most often have a sense of purpose. Being able to accomplish something while they’re out running errands goes a long way to making them a loyal customer. A key takeaway for your campaign: If you can, help your customer accomplish a task very easily, such as scheduling an appointment or looking up a record of their data. If they can’t do it easily, you defeat the purpose of making it available to them. Informing: When customers look for news or other types of current information, they may not have a specific topic in mind. 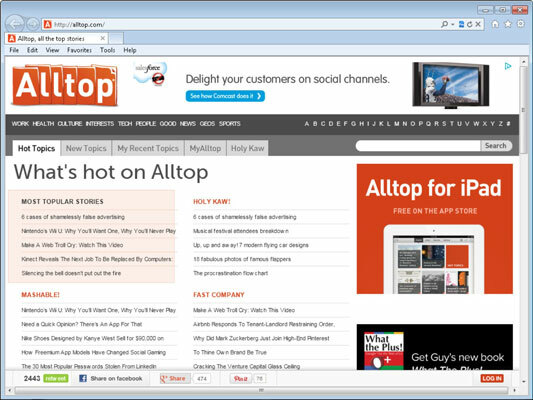 It’s up to you to help surface the most important content, like Alltop does. A key takeaway for your campaign: Try to aggregate your content so that people can easily scan it for the topics that interest them most. Perhaps you can group your most viewed blog posts together or surface breaking news. Shopping: There was a time, not that long ago, when people feared buying something from the web. Shopping carts were faulty, and there were no entities like VeriSign to verify the credibility of an online business. Many shoppers felt that punching in their credit card number online would be chancy at best. Not so today. Thanks to sites like Amazon, shopping can be a care-free affair. A key takeaway for your campaign: Make sure that comparison-shopping sites have your data. 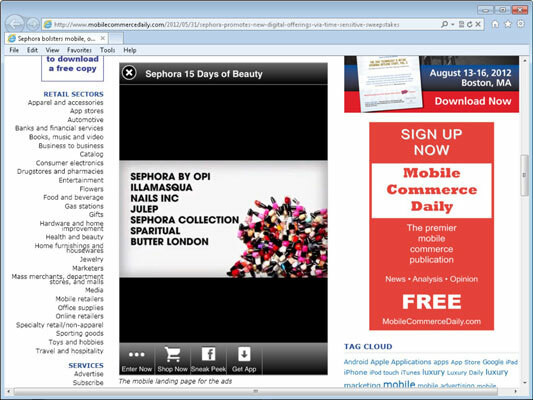 Mobile shoppers most often access these sites. They take their mobile devices into the stores and use an app that lets them scan bar codes or take a shot of the product and find pricing information online. 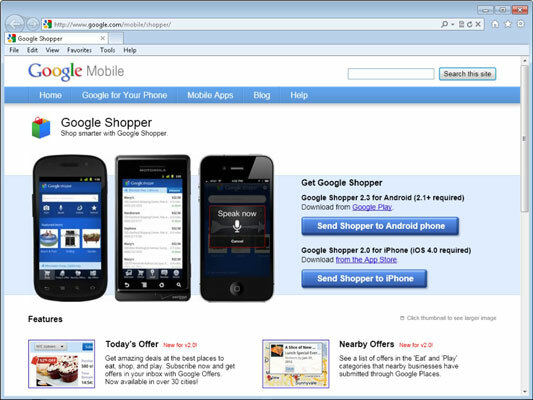 For instance, consumers can use the Google Shopper app to compare prices quickly while they’re on a shopping trip. Another way that buyers can comparison-shop is by using their mobile browser to visit sites like Bizrate. One key to shopping behavior online is the type of technology available. One of the technologies currently under consideration by communication companies like Nokia is near field communication (NFC). It’s a delineation of standards for companies creating mobile shopping technology for smartphones that requires the phone to tap or be close to the source of the item. What that means is you can complete a transaction by touching or tapping something. Some people call it tap to pay. Technology experts predict wide use of this technology by 2016. Navigating: You know that being found is the lifeblood of any local business. If you rely on foot traffic, look into companies like Foursquare to help you reward customers for stopping by. Key takeaway for your campaign: Make sure that your business’s physical location is correct on all popular mapping services, including Google Maps, Yahoo! Maps, and MapQuest. If it isn’t, alert customers to how they can revise their GPS or other maps to find you. Don’t take anything for granted with mapping. You should also submit the corrected information to the mapping service. They will correct it.